What Happens to the Democratic Party if Clinton Loses? There's been lots of speculation about the fate of the Republican Party if (as most of the prognosticators expect and hope) Donald Trump loses. There's been less speculation, though recent polling suggests it may be in order, about the fate of the Democratic Party if Hillary Clinton loses. Certainly there's reason to think -- or fear -- that the Republican Party will change. Republicans likely won't supply the bulk of support for free trade agreements as they increasingly have for 40 years. Prominent Republicans probably won't press for mass legalization of illegal immigrants, as they did in 2006, 2007 and 2013. If Trump loses, the Republican electorate will have become more downscale and elderly -- a continuation of a process that's been in train since the middle 1990s. The long-term migration of voters southward along Interstate 95 will have made the East Coast just about as solidly Democratic as the West Coast, leaving a Republican rump in the interior South and the Great Plains. Anti-Trump Republicans hope the Trump effect will just go away, and will note that a defeated Trump will not leave behind much in the nature of an institutional apparatus, as the defeated Barry Goldwater arguably did in 1964. But the argument for going back to pre-Trump positions is weakened by the fact that Republicans have lost four of the six presidential elections between 1992 and 2012. But what if Hillary Clinton loses? The political map in that case will look quite different, with Democratic states confined to the Northeast, West Coast and a few splotches in between. The presidential Democratic Party, like the congressional Democratic Party, will be concentrated in heavily Democratic central cities, some sympathetic suburbs and scattered university towns. The shock for Democrats if Clinton loses will likely be more severe than for Republicans if Trump loses. "Imagine the best candidate in your party losing to the weakest candidate in the other party," speculates Dan McLaughlin, writing for the National Review, "after years of telling yourself that your party had unlocked the demographic code to a permanent majority." One option for Democrats would be to moderate their policies, as the New Democrats urged in the 1980s and Bill Clinton did in the 1990s. After all, that proved pretty successful. But the current Democratic electorate has little stomach for going back to that strategy. Two decades ago, lots of self-described moderates and even conservatives voted in Democratic primaries. Not so these days. The slump in Democratic primary and caucus turnout, from 38 million in 2008 to 31 million in 2016, was due to a sharp decline in turnout by self-described moderates. Hillary Clinton's move from her husband's 1990s triangulation to her near-total acceptance this year of Bernie Sanders's left-wing platform was a rational response to changes in the Democratic primary electorate. 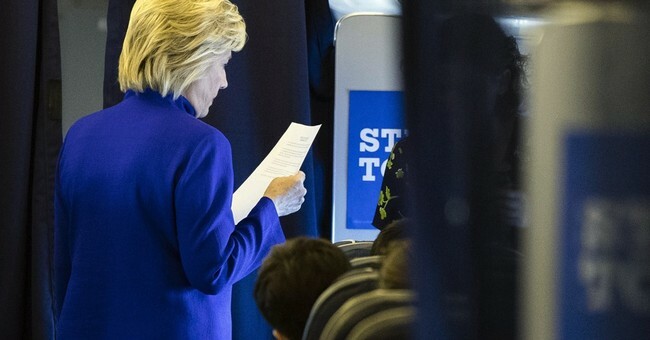 Some Democrats will blame a Clinton loss on her particular problems -- lies about her illicit secret email server, doubts about her health -- and if she loses it's not likely she'll run again at age 73. So who will? One lesson of recent presidential primaries is that Democratic voters are transfixed by identity politics, having elected the first black president and chosen the first female presidential nominee. Another is that there's a large constituency for left-wing candidates. What they haven't been interested in is cisgendered white male liberals. The largely forgotten John Edwards fell by the wayside quickly in 2008, and Martin O'Malley, with credentials similar to those of Bill Clinton and Michael Dukakis, attracted zero support in 2016. That leaves them with no obvious choices if Clinton loses this year. Their most visible and attractive left-wingers, Bernie Sanders and Elizabeth Warren, will be over 70 in 2020. Prominent black and Hispanic officeholders tend to represent overwhelmingly Democratic constituencies and have made few of the bows to moderation that made Barack Obama a plausible national candidate in 2008. It's possible that a post-2016 Democratic Party could look like Britain's Labour Party, which has abandoned the New Labour posture of Tony Blair that produced three landslide victories in 1997, 2001 and 2005. Now, under far-left-wing leader Jeremy Corbyn, the party seems headed for landslide defeat in 2020. Of course, it's possible Democrats could rebound during an unpopular Trump presidency, just as Republicans could during an unpopular Hillary Clinton term. But it's also possible that the party's current left-wing constituency could make a post-Clinton Democratic Party unelectable outside its left-wing redoubts.